Today UNICEF released its progress report on child mortality, which heralds the lowest ever number of under-5 deaths. The number of under-five deaths worldwide has declined from 12.7 million in 1990 to 6.3 million in 2013. This is important progress, and it is especially heartening to see reductions in mortality across every age group and in every geographic area. Yet while millions more children reach their fifth birthday today than did so in 1990, we still lose 17,000 children under age five every single day to preventable causes. This is sobering news, and we were disappointed to learn that our collective progress was not better. With only 471 days remaining to work towards achieving the MDGs, we simply must accelerate progress on child survival. The UNICEF report underscores that most of the 6.3 million child deaths in 2013 were preventable, stemming from such easily and affordably treated afflictions as pneumonia, diarrhea, malaria and neonatal complications. It is imperative that we amplify the provision of life-saving interventions in key countries, and that we do so by leveraging existing platforms whenever possible. There is no time to lose and no capital to waste. This report is based on data covering a time period that ended in 2013. Going forward, we expect to see steeper declines, as important activities started across the past year begin to yield results. These efforts include the distribution of massive numbers of malaria bednets following an infusion of new funding in 2013 and 2014; the introduction of new vaccines; advances in providing community-based care; and more effective financing approaches by leading funders including USAID. Finally, this year’s report also indicates that the leading cause of under-5 death is now preterm birth complication rather than pneumonia, in part reflection of our progress addressing the historically highest causes of child deaths. Many of these newborn deaths are easily prevented with simple, cost-effective interventions, yet there is still remarkably high degree of variability in the utilization and quality of services provided to pregnant women and their babies. The global community must redouble its efforts to support pregnant women and ensure that they give birth under the best possible conditions. I look forward to working with all of our partners to remain focused on saving every child’s life that we can, and to meeting the goals that we set for ourselves at the turn of the new millennium. 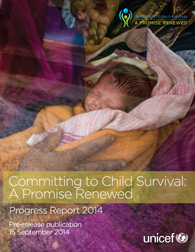 We are nearing the end of our once-in-a-generation challenge to end preventable child deaths. Let us stand together to fill the gaps that remain unfilled and to build the strongest foundation possible for every child, every family and every community.